Actress Diane Guerrero, left, and Rep. Ileana Ros-Lehtinen, R-Fla., speak at a news conference Thursday calling for adding a Latino museum to the Smithsonian Institution on The Mall in Washington, D.C. Other Congressional backers of the measure stand behind them. WASHINGTON — More than a dozen years after elected Latinos in Congress first started pushing for a museum on the National Mall celebrating Hispanic history and culture, they are rebooting the effort — with the help of some star power, Hollywood actress Diane Guererro. 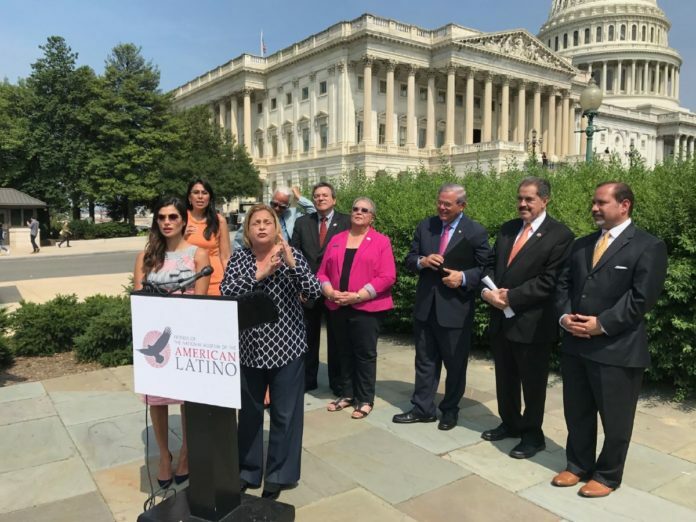 At a press conference outside the U.S. Capitol Thursday, Guererro, who has appeared in Netflix’s “Orange is the New Black” and CW’s “Jane, the Virgin,” joined a bipartisan group of Latino lawmakers, who announced they were once again introducing legislation to create a Smithsonian American Latino Museum on the National Mall. Rep. Ileana Ros-Lehtinen, R-Fla., the first Hispanic woman elected to Congress and Sen. Bob Menendez, D-N.J., headlined the group of elected representatives. Among Texas lawmakers, Senate Majority Whip John Cornyn, R-Texas, and U.S. Rep. Will Hurd, R-Helotes, who represents a large portion of the border, were not able to be at the press conference but are co-sponsors of the legislation. U.S. Rep. Henry Cuellar, D-Laredo, told The Monitor that he would also support the bill. “The history and culture of American Latinos are ingrained in the fabric of this great nation,” said Cornyn in a statement. “More than one-third of the Texans I represent identify as Hispanic, and I’m proud to again join Sen. Menendez as we fight to honor their heritage with this first step for a museum.” Hispanics are the largest minority in the United States with 18 percent of the U.S. population, or 58 million people. The idea of a Latino museum has gone through a number of steps through the years which are required of any museum that will be part of the Smithsonian Institution, the government supported chain of museums in Washington. There has been a commission that made a report that laid out the basis for building the museum and there is a non-profit fund raising group, the Friends of the National Museum of the American Latino. But legislation has stalled for the last five years and lawmakers are now emboldened by the success of the newly opened National Museum of African American History and Culture. Why would the lawmakers think they could succeed with President Trump in power, who has been critical of immigrants, especially Mexicans, and has made building “the wall” on the southern border his signature issue? The announcement came, as Guerrero noted, on the fifth anniversary of DACA, the law that protects so-called “Dreamers” — young people who were brought to the United States illegally — from deportation.